One of a kind dress, handmade from Vintage Neck and Bowties! I made this dress for myself several years ago, so it is has been worn, and has proven very durable and comfortable, if you really like this design I can get as close to it as possible for you. 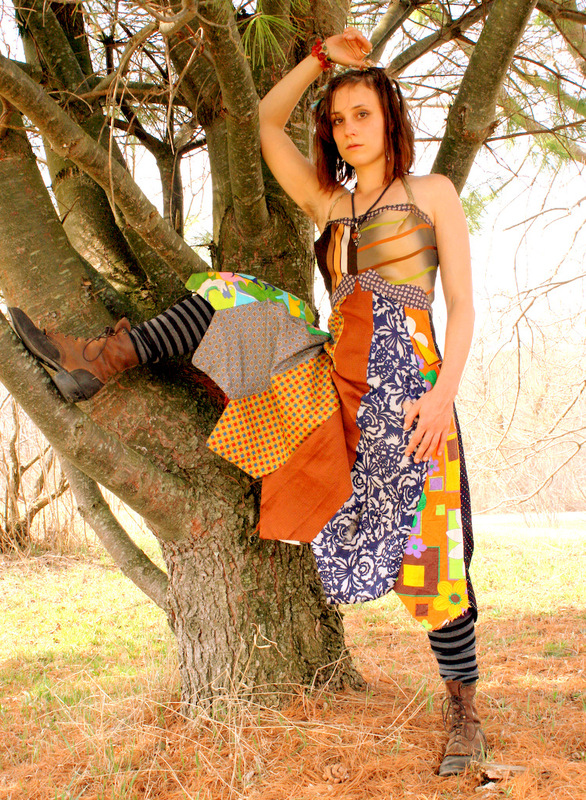 If you would like a dress similar to this one or in another size, please contact me directly sasha@tatterdamelion.com or purchase one of my custom necktie dresses from my etsy store http://www.etsy.com/shop/tatterdamelion. I love making garments from neckties it is like a puzzle fitting them together so that they create an active composition that will flatter the figure. I also really enjoy the idea of taking a masculine business world symbol and turning it into something that is fanciful and feminine. Because I do not use a pattern, and all my materials are vintage neck ties, each item I make in this way is entirely unique…no two will ever come out exactly the same, and I love to explore new ways to put them together.